I am excited to announce my latest self-paced workshop. 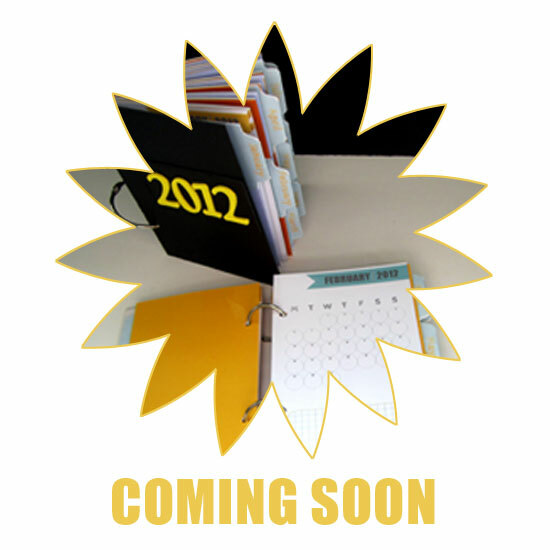 In this workshop you will make your own planner for 2012. The workshop will provide you a video tutorial as well as written step-by-step instructions to complete a beautiful planner – all at the comfort of your own home. You will also get a full pre-designed planner kit, in both JPG and PDF files for instant download. I will walk you through the process of putting the planner together, as if I am standing right next to you. Monthly and weekly planner pages. Shopping list – this list will take in anything from groceries to scrapbook supply through the latest fashion and beauty must haves. To do list – for extra gratification, the entire task is bound in a circle to check off when it is done. A page for reflection – to use as a journal or to jot down things you wish to remember. A page designed especially for sketching creative ideas you come up with throughout the day – you will have both white spaces as well as graph paper and dots to cater to all your design needs. In addition, this year the workshop includes both the front and back design of each of the reoccurring spreads, to accommodate double-sided printing! This will help you save money on cardstock as well as make your planner more environmentally friendly. In fact, if you do all the printing at home, out of pre-cut 4″ by 6″ cardstock – you will have no paper waste at all! For only $12 and the cost of the simple supplies you will get a beautiful, meticulously designed planner. Not only that, but you may also use the kit to create planners for your friends, family and colleagues – a great handmade and affordable present for the coming holidays. You may also alter the JPG files, change their color, add or subtract elements and personalize it with a photo editing program, such as Photoshop or Photoshop Elements. The workshop guide also provides tips and suggestions on how to harness your creativity to customize the planner and make it uniquely yours. Coupled with a high resolution video tutorial you will also find clear and concise written step-by-step instructions, paired with large colorful pictures of each and every step – leaving all the guesswork out of the equation. But wait, don’t stop there, with the extra pre-designed pages you will get, you will also be able to make your own sketch book, diary or list booklet. Just print extra copies of these pages and bind together to create a whole different product, uniquely yours. Immediately after registering to the workshop, you will gain access to the entire kit for instant download. Note: all the tools and supplies are pretty basic and can be found at your local craft and office supply store. As always I offer each member full support and encouragement. P.S. : You are going to love this planner… OR your money back! I am so confident you will absolutely love the planner you’ll make, that I am offering a full money back guarantee. If you are not fully satisfied with the workshop, just send me an e-mail and I will refund 100% of your purchase – no questions asked. Instant access to all the workshop’s material. 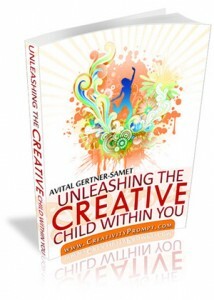 I am super excited to announce the launching of a new unique workshop by Creativity Prompt. Whether you are expecting a new baby soon, you have just had a new baby or you want to give a special gift to a new mom, “Welcome Little One” is exactly what you are looking for. This workshop offers a quick and easy way for the busy new mom to put together a gorgeous mini album to capture and record the first moments of the precious new born child. The workshop is unique by providing pre-designed pages with journaling prompts, all sized to the standard 4″ by 6″, so that all you have to do is to print the pages, add the photos and tell the stories. All the guess work is left for the upbringing of the child, none for the child’s very first mini album. In addition, by providing all the patterned papers and titles in the pre-designed pages, the workshop is also reducing the supply list down to the absolute minimum necessary. In fact, chances are that you already have all the supply at home, especially if you like recycling old boxes for their chipboard and old clothing for their fabric. Thus, basically the cost of this mini album is limited to the cost of the workshop and prints. Thats it! Not only that, but the workshop also provides a set of digital frames you may use on your digital pages, lay over photos or print on your own patterned papers or cardstock, in case you prefer your creative freedom over pre made templates. Furthermore, as the workshop kit is digital, you may use it over and over again for the same low price. A pdf file with clear and concise step by step instructions, supported by color photos and supply list. 10 jpeg files with pre-designed pages – to be printed at home or online. 10 png files with digital frames, you may use with your photo editing software. An embroidery guide for the cover of your mini album (Plus instructions on how to make your own embroidered title guide). Type: Self paced, downloadable workshop. Software requirements: None. If you wish to use the digital frames you will need a photo editing software such as Photoshop or Photoshop Elements, but it is only optional. How Does The Workshop Works? Immediately after the purchase you will be asked to confirm your membership, simply follow the instructions you will get on your e-mail. After the successful registration you will get instant access to all the workshop files with simple downloading instructions. If you have any question, please leave a comment here or contact me via e-mail. 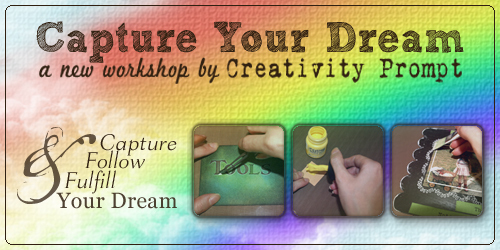 Capture your dream is a self paced workshop designed to help you identify your dream, capture it in a beautiful handmade mini-album and pave your way to make your dream come true. In this workshop you will complete a mixed-media mini-album, which you will create from scratch with things you have lying around in your house or things you can find in your local craft or office supply store. Each project is propped up by a pdf file with clear step-by-step instructions, packed with valuable tips and techniques and backed with supporting photos. As always the inspiration and journaling prompts are going to make you think and ponder. You will get fantastic insights not only to your deepest dream but also to the means of making it happen. Boosted with inspiration prompts, stimulating journaling and motivated by meaningful creative projects, you will capture your dream and follow it toward realization. How to make your own fabric covered and embroidered mini-album. Different ways to include your journaling on your scrapbook pages. Different ways to add layers, texture and interest to your layouts. How to inject meaning into your projects with tactile and visual similes. How to get chronological perspective through journaling. How to communicate and work side-by-side with your dream. I am offering personal guidance and support to each participant on each step of the way, everything to make you feel like I am sitting right by your side. Do you want to capture your dream in a significant and expressive way? Join now and get one step closer to making your dream come true! The workshop is self paced. You will receive the first segment (Introduction & Supply List) immediately after registering. The duration of the workshop is 6 weeks (5 lessons per week). That’s 30 lessons delivered right to your inbox!!! Format of the lessons – Downloadable pdf. files – including templates, instructions, supporting photos and supply list with live links to the products. Hurry up and register now to secure a place in the workshop. Unfortunately, I need to limit the number of participants in order to provide the individual attention each participant deserves. P.S. : You are going to LOVE this workshop… OR your money back! I am so confident you are going to love this workshop that I am offering you a full money back guarantee. If for any reason you are not fully satisfied with the workshop, just send me an e-mail and I will refund 100% of your purchase. No questions asked. Q: The workshop is pretty intensive what if I’m too busy for 5 lessons per week? OR I’m going on vacation soon and would miss some of the lessons. A: No problem. The format of the lessons allows you to take them at your own pace, whenever it is convenient to you. You can take one lesson every day or take several lessons during the weekend or in an afternoon. I will still be available for you to answer questions and offer support. Q: Will there be a special forum for the workshop’s members? I’d like to connect with other members. Q: Will I have to buy special tools and supplies for the workshop? A: As scrapbookers you probably have most of the tools and supply needed for the workshop. About 10 days before the workshop starts I will send each participant a complete tools and supply list. Q: What if I don’t like the workshop? A: I cannot imagine this happening 😉 Now seriously, in case you are not happy with the workshop for any reason, drop me an e-mail by the end of the workshop and I will refund 100% of the purchase price. This workshop is for 2010, you will find an updated version for 2011 here. I am excited to announce my latest self-paced workshop. 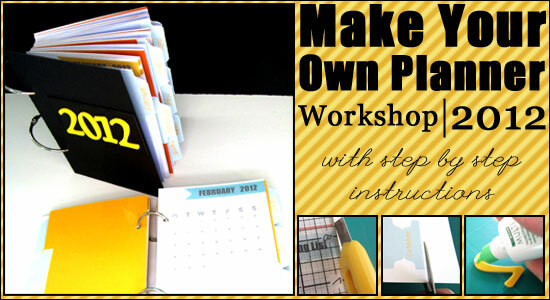 In this workshop you will make your own planner for 2010. The workshop will provide you step-by-step instructions to complete the beautiful planner you see above – all at the comfort of your own home. 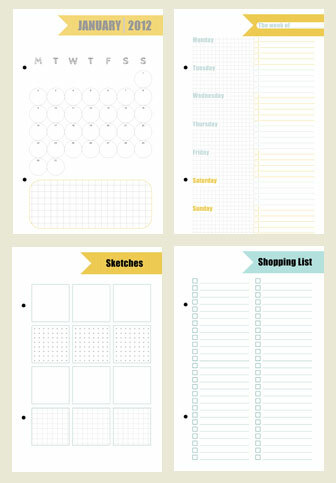 You will also get a full planner kit I designed, in both JPG and PDF files for instant download. I will walk you through the process of putting the planner together, however you will have to handle all the “wow!” you’ll hear yourself. A page for information you wish to remember. A page designed especially for sketching creative ideas you come up with throughout the day. For only $10.95, less than a price of one designer planner, you will get a beautiful, meticulously designed planner kit. Not only that, but you may also use the kit to create planners for your friends, family and colleagues – a great handmade and affordable present for the coming holidays. You may also alter the JPG files, change their color, add or subtract elements and personalize it with a photo editing program. The segments of the workshop are jam packed with tips and suggestions on how to harness your creativity for customizing the planner and make it uniquely yours. You will also find clear and concise step-by-step instructions, paired with large colorful pictures of each and every step – leaving all the guesswork out of the equation. 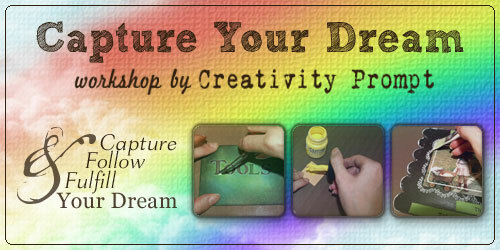 Immediately after registering to the workshop, you will gain access to the entire kit for instant download. You will also receive the first segment with an introduction and a complete tools and supply list. Note: all the tools and supplies are pretty basic and can be found at your local craft and office supply store. For your convenience, the list contains links to recommended online stores that sell these products. The following three segments will be delivered to your inbox every day. Just enough time to allow you to complete the former segment without overwhelming you with all the information at once. In a span of 4 days, you will get all the workshop material and complete your planner (depending on your preferred way to print out the planner kit). Instant download of kit and complete delivery of workshop segments in a span of 4 days. Step-by-step photos and written instructions. Unlimited personal use of the planner kit: make as many planners as you’d like.